The month of March for the Kurdish people is a month of pain because of the memories of the worst massacres committed against it by the occupying regimes of Kurdistan in all four parts. The most important of these massacres is the massacre of Halabja by the Iraqi Baathist regime and the massacres of Afrin by the Turkish occupation and its mercenaries. These days mark the 31st anniversary of the massacre of Halabja which was committed by the Baathist regime led by the dictator Saddam Hussein in Iraq on March 16, 1988, which bombarded the city with poisonous chemical weapons, killing more than 5,500 Kurds, mostly women and children. The city of Halabja was under the protection of the Peshmerga forces of the Patriotic Union of Kurdistan and the city’s rebellious people against the rule of the Baathist occupation of Kurdistan in March 1988, and with the approach of the Iran-Iraq war from the end at that time, the Baathist regime, led by Ali Hassan al-Majid ( Ali al-Kimawi), bombarded the city with rockets and artillery ordered by Saddam Hussein on 15-3-1988 and the Peshmerga forces withdraw to the mountains , where the women and children remained in the city. On 16-3-1988, the Ba’athist regime threw chemical gases from the warplanes into the city, which was home to more than 40,000 civilians, to commit the most egregious massacre in the history of mankind, which took place with poisonous gases and killed more than five thousand and 500 Kurdish civilians in that city and forcibly displaced tens of thousands into camps on the other side of the border with Iran. The news of the massacre spread as quickly as those weapons had stolen the lives of thousands in a matter of hours or less, to enter the city in terrible calm and paralyzed everything by the silent genocide that killed thousands of children, women and men with no blood or wounds. All of them were martyred in their place, the streets of the city and hamlets filled with martyrs, on the roads and in front of houses and inside, in schools and mosques and markets, the bodies lying without any blood or wounds, and perhaps the most images that remained in the memory of the world in general and the Kurdish people is the image of the Kurdish man Omar Hawar embracing his newborn baby, and the family that lost her life together. The Massacres of Afrin .. captive city and genocide filled with noise and screaming against its people in front of a deaf and dumb world ..! The anniversary of the genocide against the Kurdish people in Halabja marks the first anniversary of the Turkish state’s attacks on Afrin, which claimed the lives of hundreds of civilians and the forced displacement of 400,000 civilians from their towns and villages. Where the March 18 is the anniversary of the forced displacement of nearly 400,000 civilians in Afrin after dozens of massacres committed by the Turkish state in its occupation offensive to annihilate the Kurdish people and eliminate the culture of the region. The victims of the Turkish massacres during the 58 days of intensive artillery and air raids on Afrin left more than 1500 civilians between martyrs and wounded, mostly women and children, not to mention the crimes of ethnic cleansing against the Kurds by the elements of the Turkish army and its mercenaries (Jabhat al-Nusra and IS) in the so called the Olive Branch Operation when they attacked the city and its countryside. The images of the massacres in Afrin were engraved in the minds of the people of the region, which amounted to more than 11 massacres in the city and its environs, including the death of 3-month-old Diana Saleh in Janders area with two others and wounding eight, as well as the massacre of Shirawa in which 11 children were playing outside the house and were martyred there. Every attempt by the occupier to annihilate the Kurdish people it confirms to the world that the existence of these people means the end of its dictatorship. This is what happened to every authority and government that came to the rule of Iraq, Turkey, Iran, and Syria, and did not reach their goals in ending these people. The Kurdish people today enjoy more support and sympathy from diverse societies in the world despite the international silence and governments that are in line with their policies according to their economy and trade at the expense of the people. 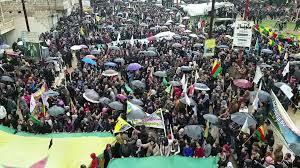 But the Kurdish people are no longer weak and became more powerful in the equation of the Middle East.